During her Bachelor in Psychology, Claire Wouters embarked on a year long MaRBLe journey focusing on emotional intelligence. During her research she spend a semester in Spain to finish her project back in Maastricht. Her project took an even more international turn when she got the chance to present her research results during an international symposium in Indonesia, for which she received a MaRBLe scholarship. Continue reading to find out all about Claire’s experience. So to start at the very start, what made you apply to MaRBLe? I first heard about the programme while taking courses by Arie van der Lugt, who is also the coordinator of MaRBLe at FPN. We also had a specific information talk about it during our second year and I had heard from other students who really enjoyed it and did MaRBLe during their semester abroad. I knew that I quite liked research and it seemed fun to do your own research for your thesis instead of just a literature review. And what was the process like after you were accepted? As you were going on your semester abroad, did you find your supervisor there? Yes, I had to find someone in Spain to supervise me, so initially I spoke with Arie van de Lugt to see what the options were. Then I searched for the university I was going to on Research Gate to see what researchers where there and what they were doing, then we contacted one of them, who was happy to supervise me. Funnily enough, it was actually more complicated finding someone in Maastricht because I was already in Spain at that point. Luckily Arie eventually found someone, but I only met him when I got back! The nicest thing was to work very independently and to look back and really see it as your own project. Did you already have a topic or did you develop that together with your supervisor? I developed my ideas with my supervisor in Spain. She was researching emotional intelligence and the concept of ‘vigor’ (energy arising from work activities). While she was investigating this for employees I applied this to students. 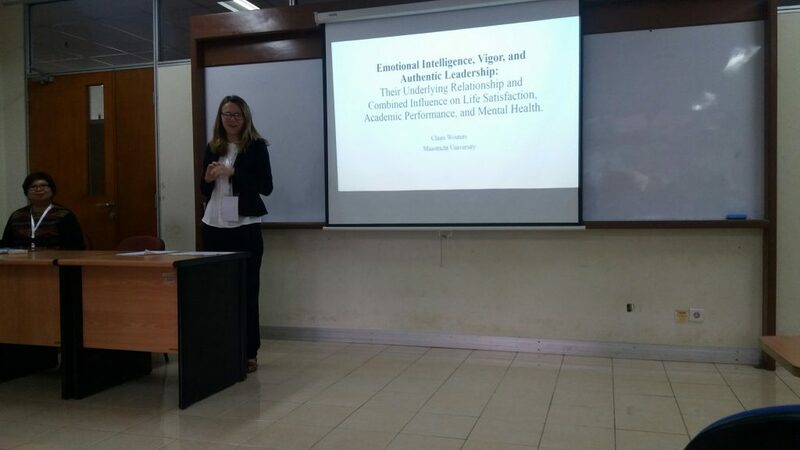 I mostly looked at the effect of emotional intelligence on leadership and the relationship between vigor and grades, mental health and life satisfaction. During the entire process what were the things you enjoyed the least and most? I struggled most with setting up the project during my time in Spain as I had to use my supervisor’s research and I didn’t always agree with every aspect, so there are some things I would have done differently myself. Then there is also always the aspect of time, which you often underestimate. Especially as you are very free in deciding your own deadlines and also have classes going on next to your research. The nicest thing was to work very independently and to look back and really see it as your own project. I could do quite a lot on my own which was great. I am also very happy that I got the chance to go to a student symposium in Indonesia and to receive the MaRBLe scholarship for that. What was that experience in Indonesia like? We got send through an email about a symposium on undergraduate research in Indonesia from the coordinators. My research fit into one of the categories so I thought I would just apply and see as it seemed like a pretty great opportunity. Of course I was very happy when I got selected. At first I thought it wouldn’t work out with the financing but then I got the MaRBLe scholarship which covered all the travel costs. It was very special experience and also exciting as I had never been that far away on my own and didn’t really know what to expect. Eventually, I gave a presentation about my research project and listened to the other students there who were mostly from Indonesia and also did research during their studies. It was quite easy to talk to everyone and after my presentation a lot of people came up to me. There were a lot of questions which was very nice. It felt like a great way to properly end the MaRBLe experience, to feel confident to show what you have found and see that people on the other side of the world are interested in that. What new insights on research did you gain through MaRBLe? When you are reading an article you don’t really know what steps led up to that publication. Now I have a better idea of that. Writing a proposal or the preparations are a lot of work that I had no idea of before, as well as the daily work that is part of doing research. In the end I enjoyed it so much that I am now applying to research masters.